At Ludmilla Primary School we teach literacy across all learning areas through integrated programs. In each classroom teachers utilize an electronic SmartBoard, computers and iPads as a resource for learning literacy through IT. In the Early Years our programs have a strong focus on oral language development as a foundation for achieving literacy outcomes. First Steps which provides a whole school approach to improving literacy outcomes is used as a resource for the school reading program. This resource, based on sound theory and research around Best Practice in literacy, provides a broad repertoire of processes to link assessment with our teaching and learning. Collaborative planning, assessment and school based moderation inform development of student centered literacy programs across the school. At Ludmilla we utilize a wide range of strategies to support and engage students who come to school with languages other than English. Explicit teaching and scaffolding the English language is an important aspect of our literacy programs. Our literacy programs involve all students in identifying learning goals, planning, self assessment and the development of their own Learning Portfolios. At Ludmilla students interests and needs are at the center of all our learning programs. Working mathematically is a central component of our school numeracy program. Students are immersed in numeracy through real life contexts and develop their problem solving skills through exploration and the use of concrete materials. The use of SmartBoards, computers and iPads in each classroom, also enable our students to practice and develop their number, measurement and spatial concepts through latest state of the art technology. Across the School the Meaningful Maths Program is used to develop efficient numeracy strategies. This program is based on comprehensive assessment and explicit teaching of strategies for counting and solving number problems. 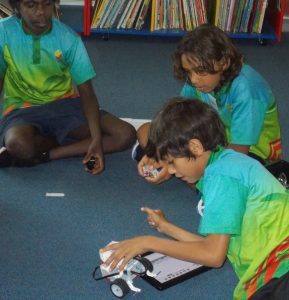 Through a range of games and other activities students learn to appreciate and have fun exploring the different patterns in our number system. This program has achieved excellent numeracy outcomes. Collaboration in the planning, assessment and moderation of numeracy outcomes is a key focus of our school base teacher professional development program. At Ludmilla we are proud of our numeracy achievements which are celebrated and shared regularly with families through our whole school multi-age maths rotations. At Ludmilla Primary School, we are committed to outstanding provision of ICT resources and learning. We believe that technology is an engaging way for students to learn and also that it prepares them for an increasingly digital world. In 2016 in line with national priorities in education we launched our Science, Technology, Engineering the Arts and Mathematics (STEAM) program. Through an integrated inquiry-based, hands-on curriculum ­students experience purposeful challenges that reflect the skills and knowledge needed to successfully progress through school and into the workforce. The STEAM program includes Robotics, Coding, Digital Technologies and Literacies and is taught from Transition – Year 6. Each classroom, including Pre-School, at Ludmilla Primary School is fitted with an Interactive Whiteboard (SmartBoard), computers and iPads. SmartBoards are used to access students to a wide variety of learning experiences available on the web and in the form of explicitly designed lessons and activities by our own teachers using the Smart software package. In addition, Ludmilla Primary School has a wireless computer lab fitted with two SmartBoards for cutting edge instruction. This room has a unique sound system built in to allow each student to be able to hear and engage with their teacher and the SmartBoard activities. Another value add to our STEAM program are our Art specialists. Music and Visual Arts are part of the learning program from Preschool to Year 6. Integrating the Arts promotes creative thinking and is associated with gains in math, reading, cognitive ability, critical thinking, and verbal skill. Arts learning can also improve motivation, concentration, confidence, and teamwork. Ludmilla has a rich diversity of cultures and many of our students have English as a second or additional language. Through our close connection with Asia, Indonesian language and culture has been chosen to be taught from Preschool through to Year 6.